I’m interviewing the internationally recognised psychologist Steve Wells on what stops people from becoming successful, in this case “socially confident”. He says: There’s always a downside to success that people don’t necessarily think of but unconsciously it’s what holds them back from being able to get there. We talk at length about the common blocks that keep people from ever getting to a place of social confidence, and share resources on how to get there. In particular, Steve shares a new technique that is super simple to release your emotional attachment to ideas, beliefs, actions and so on. Steve Wells is an internationally recognised psychologist, leadership coach, author, and peak performance consultant. He regularly presents and consults worldwide with elite athletes and business leaders to improve their performance and enhance the performance of their teams. Steve has been researching and teaching energy techniques for 19 years and is co-creator, with Dr. David Lake, of Simple Energy Techniques (SET), and Provocative Energy Techniques (PET), and has recently developed Intention-based Energy Process (IEP). He has helped many thousands of people through his worldwide workshops. Steve is co-author of 5 books, including Enjoy Emotional Freedom. Subscribe to the “Social Anxiety Solutions” podcast! Can you please help spread the message? I would really appreciate a simple (one sentence is enough) review in iTunes as this is seen as a “stamp of approval” which causes iTunes to know this show is great and will therefore be shown to more people who’re struggling to beat their social anxiety. A question I am asked most frequently, is “how long will it take to overcome my social anxiety?”. And the short answer is that it depends on your situation. But most people can overcome the bulk of your social anxiety in 1-2 months, investing about 30min of tapping on the right issues. I’ve created a PDF to help you shorten the journey, and to uncover some of the right issues to target your tapping at. 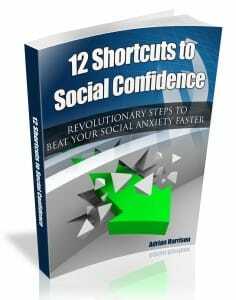 This PDF is based on coaching socially phobic clients since 2009, and it’s called “12 Shortcuts to Social Confidence”. Each shortcut shortens your journey, getting you social anxiety-free much faster. Download it by clicking on the image below. When you want my help to overcome your social anxiety, get details of my 1 on 1 online Skype coaching here. To see if my online EFT tapping-based program to beat social anxiety is a good fit for you, go to my homepage. I have designed my website in a simple and straightforward way to break down the complex issue of overcoming social anxiety into a step-by-step education. This starts the moment you enter my site. As I share my own story I teach what I’ve learned, what didn’t work, what mistakes I made you can avoid, and what works time and time again. Plus I break everything down visually step-by-step so the complex becomes easy to digest. As you read and absorb the information I’ve been able to put together from over a decade of dedication to resolving my own social anxiety, studying under brilliant therapists, and helping socially phobic clients overcome their social anxiety since 2009 you’ll also find out whether the program is for you, or whether you are better served by getting therapy. You’ll receive all the information and insights you need to make a well-informed, intelligent decision that serves you best and that can you shortcut your on journey to social confidence significantly. Click here to go to my homepage. The below mini-book teaches you one of the main core principles to become anxiety-free. After you’ve signed up you get it as a gift that furthers your education to eliminating your social anxiety completely. And, as you sign up for the newsletter I’ll send you the best tips, shortcuts, solutions and words of encouragement and support, as well as the weekly video and Social Anxiety Solutions podcast to assist you in unlocking your natural social ease and comfort. 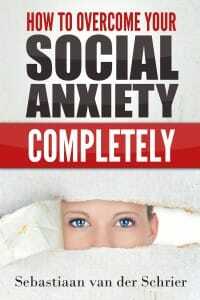 Sebastiaan van der Schrier is a Social Confidence Coach and ex social anxiety sufferer. He helps socially anxious people become confident using a unique and painless approach. He is the creator of the Social Confidence System and the host of the Social Anxiety Solutions podcast show. Social Anxiety Solutions © 2019 All Rights Reserved.